DALLAS — Tape studies, traditional stats and the eye test all tell the same story—Amari Cooper is an immensely talented receiver, with a skillset that is perhaps uniquely suited to the strengths of his new quarterback Dak Prescott. The Dallas Cowboys traded their 2019 first-round pick for Cooper in the hopes that he could be the separation-producing No. 1 wideout that brings out the best in Prescott and reignites their passing game. But while there’s no question Cooper is talented enough to rise to this standard, a closer look at the 24-year-old receiver’s career performance with the Oakland Raiders suggests the Cowboys may have to get more from him than his former team did in order to justify the high cost of acquiring him. Wide receivers in the NFL are typically measured by fans and media according to their total yardage. A No. 1 receiver is usually expected to be one of the league leaders in total receiving yards. Much of the excitement surrounding Cooper is because of the fact that he looks good by this standard, finishing with more than 1,000 yards in each of his first two seasons and ranking 14th in receiving yards among wideouts in that time. But what yardage totals don’t show is that Oakland often struggled to get the ball in Cooper’s hands when they wanted to; that Cooper at times dropped more passes than expected; and that, as a result of these tendencies, Cooper was held back from having an elite impact on the Raiders expected scoring margin. Ultimately, the Cowboys can expect Cooper to be a valuable piece from Day 1 based on his results with his former team. To get elite production from him, however, may require a combination of better usage by Dallas and more consistent play from the fourth-year receiver. When focusing only on Cooper’s successful plays—receptions that gained enough yards to advance his team’s prospects of scoring—the former Oakland wideout sure looked like a No. 1 receiving threat in his first two seasons. Only 16 receivers in 2015 and 2016 added more to their teams’ expected scoring margins on successful plays than Cooper did in his two most successful seasons, according to an expected-points model created by Ron Yurko, Sam Ventura and Maksim Horowitz. His average successful play ranked sixth by EPA in that same span among receivers with at least 100 successful plays. The issue with looking only at successful plays, however, is it gives us an incomplete impression of how receivers are actually affecting their teams’ prospects of scoring and winning. Incompletions and interceptions significantly hamper a team’s chances, as do completed passes that don’t gain enough yards to improve the odds of extending drives. When we lean on traditional stats to evaluate receivers, we typically do a really poor job of accounting for the impact of these failed plays. 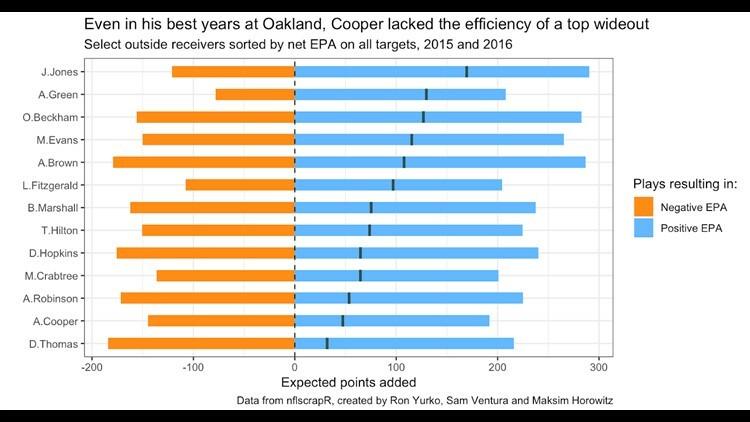 In 2015 and 2016—the same seasons where Cooper ranked 20th and 26th in total positive EPA, respectively—he also ranked seventh and 21st in total negative EPA. In the chart below, I’ve selected key receivers known for being top outside receiving threats from 2015 to 2016, and sorted them by how much their targets impacted their teams’ expected scoring margins. The vertical bars below mark each receiver’s net EPA. The orange denotes EPA lost on failed plays, and blue stands for EPA gained on successful plays. Notice how players like Odell Beckham Jr. and Antonio Brown contributed nearly as much on positive plays alone as any receiver in the NFL. However, because the Falcons’ Julio Jones balanced a ton of positive plays with few negative ones, he was more efficient as a pass target. You can see above how Cooper, like Beckham and Brown, was hampered substantially by failed plays, with fewer positive plays to show for his efforts. Part of this is due to his lower share of targets. Part of it is simply because of efficiency. It’s difficult to assign credit or blame for Cooper’s successes and failures in a league where the quarterback and system play such a significant role in a receiver’s results. For the Cowboys, to get the most out of Amari Cooper, they will have to take advantage of his incredible talent while being smart about how and when they target him. Limiting the number of failed plays—such as incompletions and catches for insufficient gains—will be critical as they try to help Cooper reach his potential. Despite being a focal point of Oakland’s offense and making a lot of plays compared to other league receivers, only 34 percent of passes in his direction during his career as a Raider resulted in first downs, with 46 percent resulting in successful plays, according to EPA. Both of these marks are slightly above league average, but noticeably below what you would expect from a No. 1 receiver. Very few receivers can justify the volume of a No. 1 threat if they’re putting out league-average first-down rates and success rates. Fortunately, Cooper’s numbers from Oakland do hint at a path for future success. First of all, we can see a trend in Cooper’s failed plays from 2015 and 2016: a disproportionate share of them came within five yards of the line of scrimmage, while his successful plays were more likely to come further downfield. When Oakland utilized Cooper within 5 yards of the line of scrimmage, he caught 101 of 150 passes for 703 yards. His first-down rate on these throws was 19 percent, and only 38 percent of these targets resulted in successful plays—far below his personal averages. While the Cowboys shouldn't abandon his routes in this part of the field, they would do well to think of Cooper first and foremost as a deep threat who stretches the field with consistent separation. Fortunately, Prescott’s tendencies are well suited for this type of receiver. He’s a quarterback who has always been more comfortable in the area of the sticks than most other passers, and has had success throwing downfield, even if he hesitates to do so as often as he could. 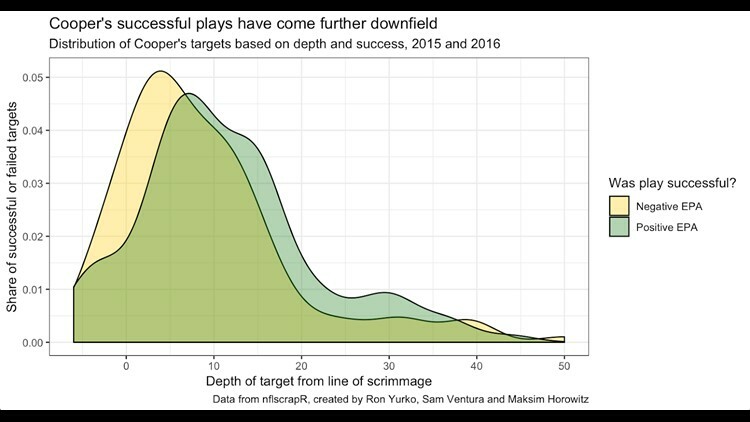 When Dez Bryant was here, Prescott’s depth-of-target distribution throwing Bryant’s way looked remarkably similar to Cooper’s distribution on successful plays in the chart above. Perhaps with a No. 1 receiver who is suited to Prescott’s strengths, he could challenge more parts of the field once more. Do you think Amari Cooper is uniquely suited to pair with Dak Prescott to elevate each other's game or would we be better suited to keep expectations low? Share your thoughts with Daniel on Twitter @CowboysStats.